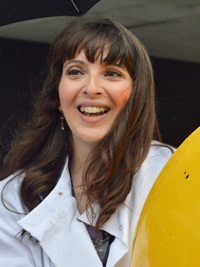 Dr. Maria Weber is an astrophysicist based at the University of Chicago. Her research is largely computational in nature, focusing on fluid dynamics, magnetohydrodynamics (MHD), and magnetic flux emergence in solar-like and low mass stars. 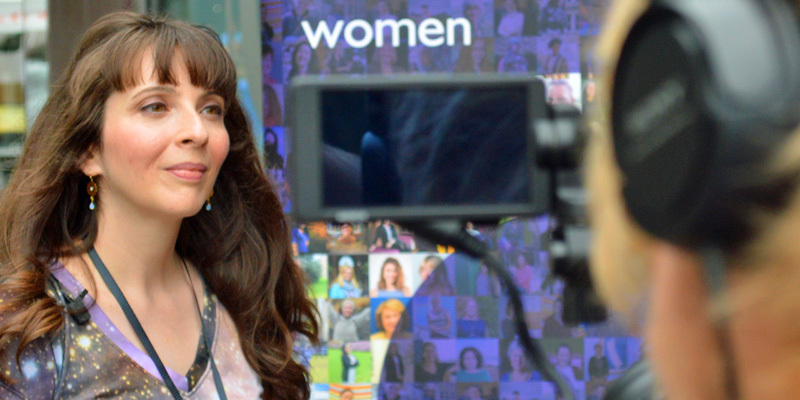 Maria is bringing Soapbox Science to America for the first time as an event organiser, having previously been a speaker at the Exeter event in 2017. Maria is the organiser of the Soapbox Science Chicago event, which takes place on 21st July 2018 from 12pm to 3pm at Navy Pier. My passion for science sprouted during my final years of high school when I began taking physics and calculus classes. I remember being amazed at how beautifully the world around me could be described and predicted with mathematical equations. When it became time to choose a university major, I was torn between a few options. In the end, I went with the subject that I knew I would miss learning more about each day – physics! After high school, I went to the University of Evansville (in Evansville, Indiana) where I double-majored in physics and philosophy. The summer before my final year of university, I participated in a research programme at the National Solar Observatory in New Mexico. This was a transformative experience for me. Here I was introduced to the world of solar physics, computer programming, and public outreach. I then went on to get a master’s degree and a doctor of philosophy in physics from Colorado State University whilst I was a graduate research fellow at the High Altitude Observatory in Boulder, Colorado. My thesis research involved studying the magnetic fields in the Sun’s interior with computational simulations. As of yet, we still do not have a complete theory to describe and predict the Sun’s magnetic behaviour, which has an important effect on Earth’s habitability and our increasingly technological world. My research is one important part of this puzzle. After receiving my Ph.D., I moved to England and started a postdoctoral research position at the University of Exeter. There I applied my knowledge of the Sun to study the magnetism and interiors of the smallest stars, called red dwarfs. Recently, I moved back to the United States and began my tenure as a National Science Foundation Astronomy and Astrophysics Postdoctoral Fellow, held jointly at the University of Chicago and Adler Planetarium. My fellowship allows me to spend about 80% of my time on research, and the remaining 20% on outreach. I divide this up by working at the University of Chicago four days a week and spending one day a week at Adler Planetarium. On a typical research day at the University of Chicago, I can be found at my computer writing code, running simulations on supercomputers, analysing my results, and writing up my findings. I frequently have meetings with my colleagues to discuss current problems in astrophysics and projects we are working on together. Every other week, I also meet with a group of graduate students and postdoctoral researchers to discuss issues of inclusion, diversity, and equality in our astrophysics community. My work at the Adler Planetarium is all about science communication. A few times a month, I head up to our Space Visualization Lab, where I speak with guests and share with them actual images of both telescope observations and visualisations of computer simulations. Observations help to motivate the types of simulations that we perform, while simulations help us to verify and test the theories that create the phenomena we observe throughout the universe. Another aspect of my work at Adler involves developing new visualisations of simulations and real data that highlight the latest discoveries in astrophysics. These visualisations are then featured in the Space Visualization Lab, planetarium shows, and exhibits. Science communication is more than just words. It is also about developing ways to share information that reach all of our emotions and senses – sight, sound, touch, and yes … even tastes and smells! There are many reasons why outreach is so important to me. One of my outreach goals is not just to share my knowledge of astrophysics, but to inspire curiosity. I want people to ask questions about the universe and the world around them, and to keep asking them when they go about their daily lives. I also think it is important for the public to put a face to the word ‘scientist’. We come in all shapes, sizes, ethnicities and genders. Through sparking one-on-one conversations between scientists and the public, we make science more accessible and learn more about each other in the process. I’m also a firm believer than an informed population is one better to make the decisions that shape the policies of the countries in which they live. In the United States, ‘fake news’ is an epidemic. As active researchers, we are in a prime position to share our discoveries directly without any middlemen and to dispel any misinformation. 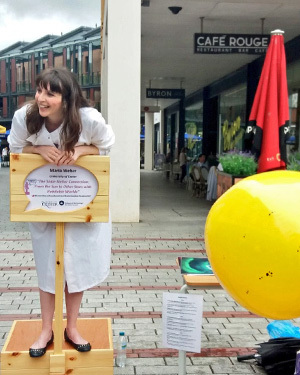 I first learned about Soapbox Science while I was a postdoctoral researcher at the University of Exeter. I saw posters around our physics building advertising the Exeter event, and I thought that it looked like a lot of fun. I was over the moon when I was selected as a speaker and I had a blast on the soapbox. Once I arrived in Chicago, I noticed that I couldn’t stop telling people about my experience with Soapbox Science. It fills a niche in science outreach that is largely unexplored in the United States – highlighting female scientists while bringing their research to public venues where people already are. 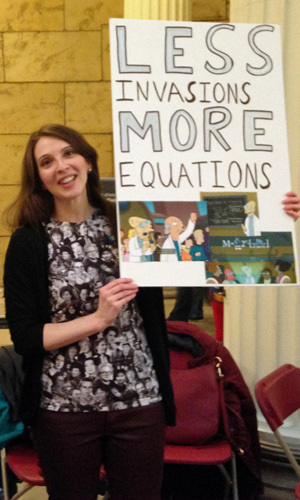 So, I decided … let’s make Chicago the first US location for Soapbox Science! With its many universities, research institutions, and museums, we naturally have a large community of amazing female scientists. Another important aspect of my motivation to become an organiser is the opportunity to provide outreach training for scientists who might not otherwise have access to such training through their universities and research institutions. The best Soapbox Science speakers are storytellers. They weave a passionate, personal story about their journey as scientists while sharing their discoveries through terminology that resonates with a non-specialist audience of all ages. Another important part of a Soapbox Science talk is to get the audience invested in the story. Speakers that effectively do this explain why their work is important to daily life or advances our understanding of the universe around us. Audience participation is also key, so frequently checking in with the audience, asking them questions, and having them participate in activities is a must. One of the many awesome perks of being a scientist is the ability to travel and have adventures. I travel to have meetings with collaborators and participate in conferences where I learn about new discoveries and share my own research and outreach efforts with others. I’ve travelled all over the United States (including Hawaii and Alaska), lived in England, and visited India, Brazil, and many European countries. Since my work is largely computational in nature, I don’t use telescopes for my research, but many of my colleagues have been able to travel to South America, tropical islands, and even the South Pole to take observations and work on telescope instruments. Having an international resume has definitely been advantageous for me, as it allowed me to develop a new network of collaborators and contacts I would not otherwise have been able to access. My time in Exeter was also eye-opening in that I got a glimpse of the many differences in the US, UK, and European university and scientific funding systems (both pros and cons). There have been many times in my career when I have doubted my ability to become a successful scientist. This is often referred to as imposter syndrome – the feeling that you are an imposter, or fraud, and not worthy of your accomplishments. This feeling tends to be more common among female rather than male scientists. On occasion, this has kept me from applying for grants, academic positions, and fellowships. One of the most important pieces of career advice came from one of my postdoctoral research advisors, who told me: “Maria, let someone else decide that your application is not worthy.” I was counting myself out of the running for anything even before I submitted my application and gave it my best shot. Without that advice, I never would have applied for my current fellowship, which truly is my dream postdoc. I have a very busy, but fun, summer coming up. I’m headed to a conference in Boston where I have been invited to talk about my research on solar and stellar magnetism. Our first Soapbox Science Chicago event is also happening at the end of July, which I am excitedly looking forward to.